Craft this all-natural body butter for your next craft show. Customers will love the pink grapefruit scent and soft silky feel. This all-natural product is relatively easy to make, and is a proven best seller at craft shows. Shea butter is whipped to a light and airy consistency, and additives are incorporated in this project. Vitamin E extends the shelf life, grapefruit essential oil makes it smell wonderful, and tapioca starch gives a soft silky feel to the butter. Package in the natural jars included, and add your own customized label. You Save $8.35 by purchasing this kit rather than buying the items separately. COMMENTS: Love this kit! First I placed the shea in the mixing bowl and broke it up into smaller bits using the metal whipping piece (for a stand mixer). I let it whip on number 6 for 15 minutes, stopping periodically to scrape down the bowl. I used 4 tablespoons of the tapioca starch and whipped some more. It doesn't seem to be possible to over-whip shea butter (as long as it's only shea butter and no liquid oils added), but the more it is whipped, the more air will be in the final product. This does not seem to be a negative for my customers, and even makes it a little easier to use. Using this method, I ended up with a little extra even after filling the containers to the brim. We keep our house pretty warm, around 80 degrees, which probably helped with the whipping process. If the shea is too hard to whip, try microwaving it for 10 seconds. And whip whip whip! COMMENTS: I made this product the other day and I thought it was very good. Even after adding the 2 tbls of tapioca powder it still felt really greasy on my skin. I will try it again and see how it does now that it has a day or so to sit. Other than that it had a fantastic fragrance and it was so much fun to make! COMMENTS: This was my first lotion kit from WSP and was really easy to use. I love the pink grapefruit scent and used it in my lotion bars too. "not what I expected sadly!" COMMENTS: I was excited to make my first product and it was a chore. I left the butter out for over an hour at room temp. with my house temp. being 73 and it was still so difficult to blend. The amount in the jars are a bit skimpy as a customer, I wouldn't buy such little for the suggested retail price. I'm actually using these as samples only. Maybe I could pair it with something else. On the up side, I think it is great for extra dry skin because it is so greasy. I changed the fragrance and boy it smells great. Not sure I wanted to smell like grapefruits all day. Easy recipe to follow, but difficult to blend the butter. COMMENTS: I love the way it makes my skin feels, and I made these as Christmas presents and everyone loves it. The only issues I've come across is that it hardens after a few days in the jar. It didn't stay 'whipped'. Something I'm going to try is after mixing it, let it sit for a day or so in a sealed bowl, and then mix again. COMMENTS: This kit makes things super easy, plus you get the discount from buying things individually which is fabulous when making them to sell! I LOVE this kit!!! Will be buying again soon! "My dry skin is renewed!" COMMENTS: I made the Whipped Shea Moisture Lotion today, and I must say, it made my skin feel so much better... in only one application!The lotion looks a little bit greasy when it is first applied, but it absorbs into the skin quickly. I used Vanilla Bean Noel Fragrance Oil instead of grapefruit, and it smells so delicious!I will purchase this kit again, without hesitation! It is a must have for dry skin! "Good kit, easy to make..."
COMMENTS: Unfortunately, my electric mixer went out on me before I had a chance to make these, but I think it still went fairly well with extra effort using a wire wisk and woman-power. This was my second attempt at lotion-making. I made 5 jars the way the kit says, and 3 jars I substituted the grapefruit essential oil for cucumber melon fragrance oil. The product turned out a decent consistency and they both smell great. I love that it's all natural if you use the pure EO. I would definitely recommend this product, because shea butter tends to be expensive because it lasts so long and heals so well, when you turn it into whipped, handmade body butter with EO, the value only increases! COMMENTS: It's my own fault for not checking the ingredients, however I thought this would be a lotion kit. It is a butter kit. There are not waxes included for water to oil emulsion. Just a slight disappointment, still a good value. COMMENTS: I love love love this kit. The lotion is so very rich and nourishing. The scent is light and refreshing. The only problem that I had was that I did not get enough product to fill all of the containers. Maybe I did not whip the Shea butter long enough. But I did end up a couple containers short. COMMENTS: The smell is great and everyone that i introduce it to like it. I am going to make more of it. COMMENTS: This was my first attempt at making whipped body butter. It turned out wonderfully well. Next time I will add color to it to make it even better. I recommend this product! COMMENTS: This product is great, and looks just as good as the pic when whipped! Mine didnt fill all jars tho, even tho I whipped it quite a bit. I would also add more Grapefruit EO as I like the scents stronger, and there was extra EO to do that. COMMENTS: Love love LOVE this starter kit. I purchased this kit as a way of breaking into making my own body butters. I was skeptical about the grapefruit scent at first but when I smelled the finished product, I was in love. I gave samples to friends and family and they all encouraged me to start marketing my own line...which after a while I actually started doing. I have since changed my formulation to be an original concoction and thus more marketable as an orignal, but I will always love this kit. Make more kits like these!! COMMENTS: I'll admit, I took a chance on this kit. I wasn't sure what to expect, because...well...shea butter can be... dare I say it...greasy. Okay, I said it, but you were definitely thinking the same thing. Well, those fears were unwarranted and this recipe yields a non-greasy formula. I was pleasantly surprised and relieved, too. After following the directions step-by-step instructions, I had the perfect whipped shea butter cream within 30 minutes. Instead of using the pink grapefruit scent which was included in the kit, i opted for Pink Sugar. I smelled so yummy all day long that people were asking me to make some for them as well. "I mistakenly used shea butter and aloe lotion to make the Whipped Shea Butter Lotion instead of ultra refined shea butter. Followed the directions exactly as written in the instructions for Whipped Lotion. What have I created? Is it anything that is useable? " Staff Answer You have still created a lotion. You added Vitamin E, Essential Oil and the Slick Fix which is used to take away the greasy feel of the shea butter (which you would not need for the lotion). The product is fine to use, but you might call it a Whipped Shea Butter and Aloe Lotion. "Are these containers okay to use with essential oils in this recipe? I thought when using essential oils that glass containers had to be used. " Staff Answer When storing essential oils yes, you should keep them in a glass container. When using an essential oil in a product it is diluted by the rest of the product and it is safe to store it in a plastic container. "The lotion hardened after sitting in the jar for a few days. Did anyone else have this problem? Is it supposed to do that or stay fluffy?" Staff Answer Hi Michelle, This lotion does harden as it sets. You can add additional oils but we have not formulated it that way. I would suggest testing in small batches until you achieve your desired results. "Just ordered this kit, and noticed that on a lot of the reviews, they stated there wasn't enough product to fill the all of the jars sent with this kit. Why would this be, and has this been fixed? Thanks!" 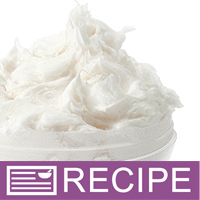 Staff Answer The recipe indicates that each jar will hold 2.5oz of whipped shea butter by weight (4oz by volume). As long as you do not overfill the jars you should be able to get the full 8 jars. This may vary depending on how light you whip your product. "First time maker here... I've seen a lot of recipes that call for a wax to mix the oils and water. Do you need a wax to make this whipped shea butter lotion? If not, will it be a benefit if it do use it?" Staff Answer Waxes are often used in lotions to help the water bind with butters and oils in the recipe. Since this recipe does not include water you do not need to use any wax. If you do use wax it will bake your finished lotion harder. Feel free to test just be sure the adjust your label for any changes made if you are planning on selling this. "I made the shea butter lotion and it was greasy and grainy. Any suggestions on how to make the lotion thinner? It is quite thick! Thank you." Staff Answer The Whipped Shea Butter is intended to be a thick body cream, not a lotion. If you would like a thinner lotion I would recommend trying our Shimmery Marshmallow Fluff Lotion Recipe or one of our other lotion recipes. If you're shea butter is grainy that means it was cooled too quickly after it was melted. "Which shrink wraps goes with these?" Staff Answer For the 4 oz Natural Classic Plastic Jar - 71 mm Top, I would recommend either the 115x55 shrink wrap band or the 120x55 shrink wrap band. They will both work, the 115x55 is just slightly more snug when initially put on the jar. "Does this have any preservatives? If so, how long is the shelf life? If not, what is good to add?" Staff Answer Since this product does not contain any water there is not an added preservative. Vitamin E is used as an antioxidant in this recipe to help extend the shelf-life of the oils. We recommend using products within one year of the manufacturing date.